Washington (dpo) - Just yesterday, President Trump’s adviser, Kellyanne Conway (50), caused consternation when, during an interview, she encouraged citizens to buy products from Trump’s daughter Ivanka’s fashion lines. Now, the White House is going one step further. 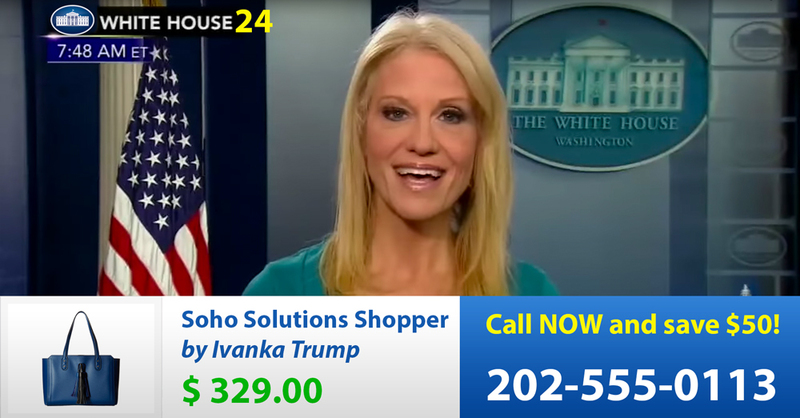 The White House’s very own brand new shopping channel WhiteHouse24 is set to offer products from the Trump family’s lines around the clock. Conway herself is set to be the channel’s anchor, having already proven her impressive credentials by selling a Trump presidency to the American public on the campaign trail. Broadcasting is due to commence tomorrow and will feature fashion designer and daughter of the President Ivanka Trump as star guest on the first show. Filming will take place in the White House’s press briefing room. The main focus will be on jewellery and clothing from the Ivanka Trump Collection, with further, classic products also on offer, including Trump Steaks, the perfume Success by Trump, the Original Trump Toilet Brush, Trump Vodka and Trump: The Game. Products can be ordered using the telephone hotline or in the online shop, which will be fully integrated into the official whitehouse.gov website. The first 50 callers to order a product will also receive the opportunity to attend a meet and greet with President Trump and a voucher valid for one presidential pardon should they ever find themselves in legal difficulties.